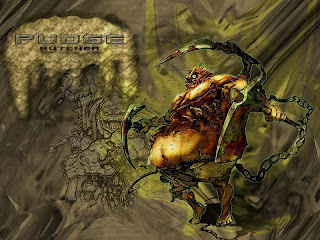 Pudge is a hero that can catch enemies from the dark and then kill his target. All of his skill was designed to torture enemies. This hero is a torturer using his skills, Rot makes your opponent feel so much pain. You will deal lots of damages while enemy is being slowed. Dismember will make enemy can't move, and Meathook will catch enemy from the dark and kill him instantly using Rot and Dismember. Meat hook is your skill to catch enemy, you then drag him into yourself. This skill is a powerful skill for ganking. With this skill you can catch enemy secretly and pull him to you and then kill him with your ultimate + your rot that deal damage per second. This is a straight line skill so you must predict your opponent's movement before casting a Meat Hook. This skill can also be used to save allies from enemies. If your allies run from enemies and in a low HP, try to save him by predicting his movement. With practice, I believe you can more accurate with this skill. Your skill to deal damages per second. Be careful, this skill is also damaging yourself, but it will be ok because you will more likely to have more HP than opponents and also you have additional magic resistance from your 3rd skill. You can also add more magic resistace by buying Cloak > Hood > Pipe. You will use this skill to kill somebody and makes him your prey that cannot run away from you because they will be slowed while taking some damages per second. Your ultimate will help you to make the target not moving while receiving damages from this skill. And meathook will catch enemies to you so you can use this skill to deal damages. Some stuns or slower will also very helpful for you to keep opponents cant move and keep receiving damages from this skill. Rot can be used to suicide, beware of this possibilities. With Rot you can deny yourself if you're in danger. 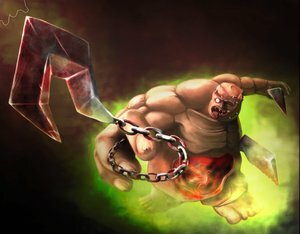 Gives Pudge resistance to magic damage, as well as bonus strength that increases each time Pudge kills an enemy Hero or it dies in his vicinity. Flesh Heap is retroactive, meaning it can gain charges before it is skilled, which then become active. Gives you an additional magic resistance. So good to defense against enemy's magic. Magic resistance will also helps you to reduce damages from you skill Rot. Beside that, this skill will gives additional Strength for you if there are heroes killed around yourself. 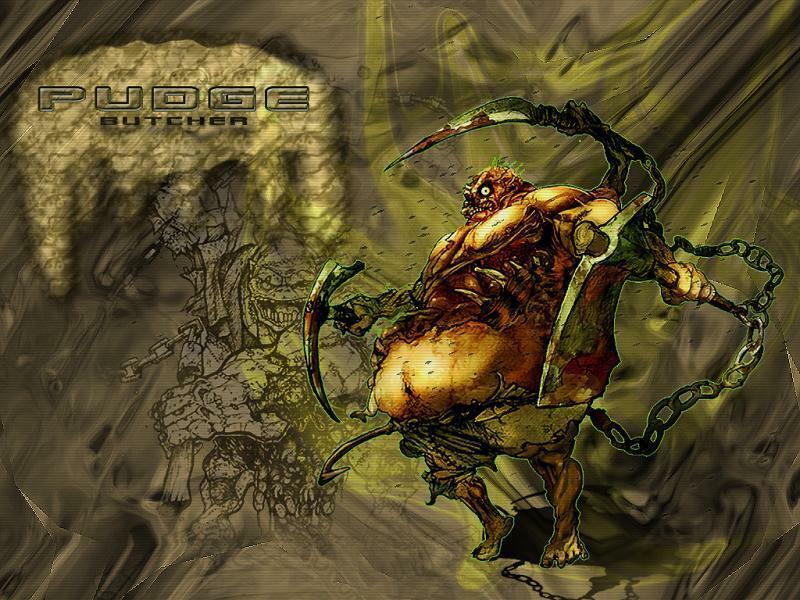 CHANNELED - Pudge chows down on an enemy unit, disabling it and dealing damage over time. Lasts 3 seconds on Heroes, 6 seconds on creeps. Upgradable by Aghanim's Scepter. Your skill to lock down enemies and deal damage per second. Before you use this skill, better you already activated Rot, so that the damages per second is the additional of Dismember and Rot. You can catch enemy using meathook and then using Rot and then Dismember. Buying Aghanims Scepter will increase the damage and will makes you can steal enemy's HP using this skill. Why take Rot for first skill? With this skill, you can get firstblood. You should ask your friend who is a stunner or slower and he can helps you disables your enemy to get firstblood. Why maxed Meat Hook first? With more level of Meathook, the range will be increased, this is what you need to gank opponent from the fog. On early game, you should lasthits creeps to increase your gold and level quickly. Pudge need some items before he start ganking. If you take the mid lane, it will be better for you because you can earn level quickly. And then you can level up quickly your Meat hook and Rot into level 3 or 4 which are more stronger. You better start ganking other lane if you already level 6 - 10, and kill enemies there. You can get firstblood in early game with your Meathook + Dismember + Rot. You also need your friend's help to make sure you get the kills. You need additional stunner / disabler that makes you can maximize the damage from Rot. You can also deal some additional damage using Meathook again. If you can get some kills on early game, the rest of the game will b eeasier for you. Here I give some examples of where you can hide and hook your target. Red dot is better for Radiant and Yellow dot is better for Dire. In mid game you should haunting enemies all around the maps. You should hide inside the jungle and ready to Hook enemy. And then eat them until death. There are some spot you can hide as a Pudge, and if enemies are not aware and place some additional wards, they will be your easy prey. What you need to do is waiting in beside the lane and hooking anyone who is not aware and kill him using Rot + Dismember. You are the beast here and they are the prey. They should pray not to be eaten by you. You should already reached high level here so you have an all high level of skills and also an already high sats, HP and damage. And so does ebverybody in the map. And also with the high level, that means a long respawn time. That means that every move is becoming more important and decisive. So keep focus and also don't be panic at every sitaution. Always think clearly and use all you have. In late game your main part is: To kidnap one of enemy heroes and make him killed before the teamfight even start! With that, the enemy will forced to fight your team with 4 man or to retreat. Try to catch one, that is your job. If you success, 80% your team will win the teamfight with 4 vs 5. This will definitely make your team has more chance to win. In late game, one person become much more important because all heroes will become strong. You need to hook properly and then use Rot and Dismember and together with your friends you can kill the enemy. Why Quelling Blade? Makes you easier to lasthits every creeps. Why Arcane Boots? You have spammable skills, so you need more mana. With this item, your mana will be fulfilled. And also to replenish mana for the team. Why Hoods? You need more Magic Protection because your Rot that hurts yourself. Passive: Ultimate Upgrade - Upgrades the ultimates of certain heroes. Why Aghanim's Scepter? Makes your ultimate become stronger. Increase the damage, and can steal enemy's HP. Vengeful Spirit is your BFF (Best Friend Forever). You and Vengeful Spirit can save each other lives using Nether Swap and Meathook. Have ion shell that deals lots of DPS, combined with your Rot, will deal monstrous DPS for enemy. Also have Vacuum that makes all ememy to stick in 1 point. This skill is a perfect setup for you to rot everybody. This works like Axe's or Magnataur skill. With you, he have a powerful combo that will hook enemies into your fountain. Before hooking, he should cast his skill that will makes you to be warped to fountain in several seconds. After that, hook someone and you will hook him until death because he will be killed by your fountain. Have a combo that similar to Pudge-Chen combo. He should stay in base and use Recall to Pudge. While channel time, Pudge should hook someone and make him killed by your fountain.